“The great directors, I’ve learned, have a great sense of rhythm.” So says Alexandre Desplat, who’s again earned two Oscar nominations in the same year (for The Imitation Game and The Grand Budapest Hotel). The statement sounds true but vague. Musicians and musicologists have a firm sense of what the term rhythm means, but how can we understand it in relation to movies? Well, surely it refers, at least, to the rhythm of the music we hear in the film. But we usually think there’s more involved. There’s rhythm in the movement on the screen. The people and things we see can be infused with a beat and tempo and pace. (Critics of the 1920s considered Chaplin a dancer, like Nijinsky.) There’s a rhythm to the combination of images too, as everybody who’s tried film editing knows. And we think that the story can be told in a way that has a distinctive pace–narrative rhythm, we sometimes call it. But how do these components work together to create an overall rhythm for the film? When synchronized sound recording entered movies, critics and filmmakers worried a lot about this problem. Filmmakers who had mastered visual storytelling in the silent era had to figure out how to merge spoken language, music, and sound effects with the flow of images. The lazy solution was simply to shoot plays, filling the scenes with dialogue. But both audiences and critics missed the dynamism of silent films. Talkies were too talky. The opposite solution, to eliminate words as much as possible and simply use music and sound effects, was of limited value. After all, silent film needed the written language of intertitles to make the story clear; why give up the advantages of spoken language? But how then to integrate image and sound into something that engaged the audience–not only through the film’s story but also, perhaps more deeply, through that elusive quality called rhythm? Today this debate may seem sterile. We think filmmakers have solved the problem. Maybe they have, collectively, but each one faces it at every moment. How do you blend movement, music, pictorial composition, sound effects, and dialogue to create an overall pace that will benefit your movie? No single recipe will work. The rhythm of the Coen brothers’ Raising Arizona is very different from that of No Country for Old Men. Both Gone Girl and Non-Stop are thrillers, but Fincher’s pacing is far more deliberate and understated than Collet-Serra’s; yet both take hold of us. Filmmakers solve the problem of rhythm in practice, often brilliantly. Those of us who want to understand how films work, and work upon us, want to get specific and explicit. What is this thing called cinematic rhythm? What contributes to it? Can we analyze it and explain its grip? Very few scholars have tackled these questions; they’re hard. 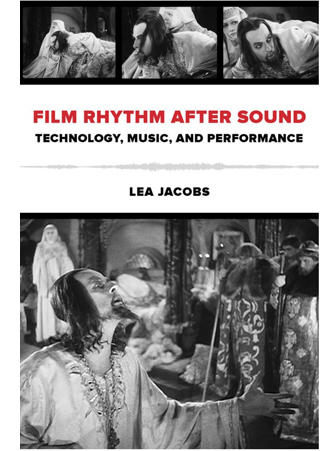 In her new book, Film Rhythm after Sound: Technology, Music, and Performance, our friend and colleague Lea Jacobs takes us quite a ways toward some answers. Lea starts from the assumption that the debates of the early 1930s are still relevant. So she looks at some much-praised examples of sound/image integration: the musicals of Mamoulian and Lubitsch and the cartoons from the Disney studio. She studies these paradigm cases more closely than anyone has before. She also goes beyond them to consider the theory and practice of Eisenstein (a big admirer of Disney) and the handling of dialogue in Howard Hawks’ work from The Dawn Patrol (1930) to Twentieth Century (1934). Central to Lea’s inquiry is the notion of synchronization. How can distinct moments in the image flow, the sound flow, and the narrative action be pinched together, like the toothpick pinning the ingredients in a sandwich? One answer is to rehabilitate the old idea of mickey-mousing. Mickey-mousing makes the patterning of the sound match, in some way, the pattern of onscreen action. Mickey-mousing has had a bad press, but Lea shows that if we look at it afresh, it offer a solid point of departure for thinking about rhythm. Eisenstein develops the idea of sync, in a fresh but still general way, in his notion of “brickwork” structure–the non-coincidence of image and sound, like the staggered array of bricks in a wall. That is, your cut shouldn’t come on the beat (are you listening, music-video directors?). Save your sync until it can have maximum impact, ideally through accenting some action in the image and maybe a high point in your drama. This is a step beyond the duality synchronous/asynchronous sound that was floated in the early 1930s. Eisenstein shows how all the different lines of pictorial and auditory movement can be woven in a flow that will create various degrees of emphasis. In this “wickerwork” pattern (another of his metaphors), actor movement might coincide with a melodic run rather than a beat, and the cut might accentuate a line of dialogue while the music subsides. Or instead of Hollywood’s underscoring, the music might be abnormally loud, doubling and clashing with dialogue in a “Godardian” manner. At certain moments, several accents in these lines could hit simultaneously. Just as important are the moments when the imagery and the mix get thinned out so that a single element–a word, a chord, a gesture–is isolated. The key example comes from Ivan the Terrible, Part I, in which the ailing tsar asks the Boyars to kiss the cross in allegiance to his baby son Dmitri. In unprecedented detail, Lea tracks how the melody, meter, motifs, orchestration, and dynamics of the music fluctuate in relation to staging, line readings, and narrative developments. In a passage lasting only six minutes, she shows how–as so often happens–Eisenstein’s practice outruns his theory and creates a rich audiovisual texture at an almost microscopic level. Rhythm is constructed frame to frame, sync point to sync point, and involves very small durations of a half second or a quarter second. This proposition may seem obvious to anyone who has been involved in editing or scoring film music. Classical Hollywood click tracks measured tempi to fractions of a frame, as defined by the sprocket holes, and there are clear indications that composers and editors haggled over durations of five or six frames. This urge to “think small” and study the finest grain of image and sound carries through Lea’s analysis of rhythm in Disney cartoons. Some have accused Eisenstein’s Ivan of being a live-action cartoon, and there’s no hiding either the old man’s admiration for Disney or his belief that cinema was capable of highly “engineered” effects. Still, music and its mickey-mousing possibilities determine animated films even more strongly than live-action ones. Lea takes Disney’s early sound films as experiments in synchronization. 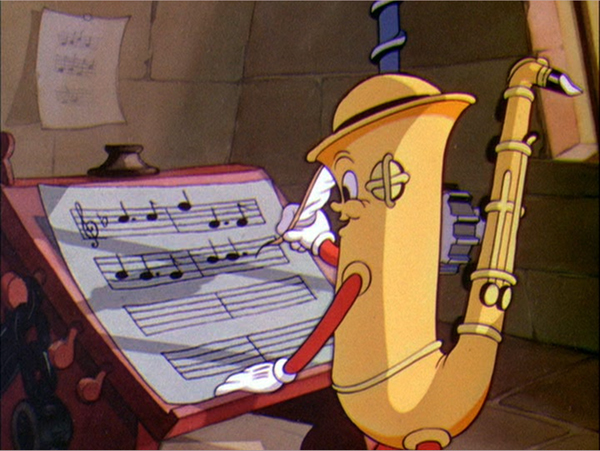 Early sound cartoons are sometimes characterized as “prisoners of the beat” because they create cycles of motion that are lined up with the musical meter. Lea traces how Disney animation became more fluid and flexible, syncing more around sound events than around rigid beats. She illustrates her case with analyses of Hell’s Bells (1929), The Three Little Pigs (1933), and Playful Pluto (1934). The last two are widely regarded as classic Silly Symphonies, and she sheds fresh light on them through the sort of micro-analysis brought to bear on Ivan. She shows how sections gain a fast or slow tempo through the interaction of many factors, of which shot length is only one. In particular, Disney directors could change pace through a tool that Eisenstein didn’t have: altering the frame rate of animation. Normal animation is “on twos”; each drawn frame is photographed twice, to last for two film frames. Many stretches of the Disney cartoons are on twos, but sometimes, to create vivid sync points, the filmmakers go “on ones,” allotting one frame for each drawing. This is more expensive and time-consuming, but it allows for the sort of fine control of pace that we find in The Three Little Pigs. There the Wolf launches into “a jazzy, up-tempo gallop” that accelerates the danger bearing down on the pigs. In a similar way, Playful Pluto creates variety by “matching movement to different fractions of the beat and establishing differential rates of movement within the shot.” Imagineering, for sure. How to convey this fine-grained analysis on the page? Lea uses the familiar tactics of presentation: verbal description, musical scores, and frame enlargements. But she goes farther. At great effort and expense, she has constructed analyses of key passages as video clips, with the film scene running in interlock with a highlighting bar that shifts across the score. Annotations on the score mark actions and sync points. These analyses are designed to be watched as you read along in the book. You’ll see some frame grabs in this entry, but to watch them simply go here, select the Audio/Video tab, and choose what you want to see from the menu. This is a real step forward for film scholarship, and the University of California Press should be congratulated for helping her take it. Why shouldn’t every film book hereafter come garlanded with clips? Okay, you might say. Rhythm is of concern to top-down audiovisual masters like Eisenstein and Disney. But there are other notions of film as art–for instance, that performance is central to its storytelling. Lea shows that, again, early sound film explored a more open and porous integration of music and image. Ernst Lubitsch, as Kristin has shown, was one of the masters of image-based cinema in the silent era. Yet as soon as sound came in, he was exploring how to blend music with the mercurial repartee and attitudes of his sophisticated characters. Rouben Mamoulian, who had indulged in sync experiments in the theatre, contributed as well to a broader trend that gave music a central role in structuring scenes. The result wasn’t exactly “musicals” as we usually understand them, although there might be song numbers; instead, the music worked its way into the crannies of the scenes–pauses in the dialogue, moments when characters cross a courtyard or boudoir. Thanks to post-synchronization (music performed after the film was shot and cut) and sync-to-playback (prerecorded music played on the set during performance), early sound films could boast a tight rhythmic bond of performance style and musical accompaniment. That created a sort of cinematic operetta, one no longer bound to a theatrical space. In “Isn’t It Romantic?” in Mamoulian’s Love Me Tonight (1932), a song begun in a tailor’s shop is passed along through Paris, onto a train, to the open road (soldiers march to it), and eventually to a gypsy campfire, where the heroine hears it from her balcony. Most historians find strong similarities between such passages in Love Me Tonight and scenes in Lubitsch’s Monte Carlo (1930), but Lea contrasts them. She argues that Mamoulian’s film is more like early Disney in syncing music one-to-one with figure movement and camera movement. Lubitsch (although working earlier than Mamoulian) is interested in synchronization at another level, linking musical segments to dramatically coherent parts and wholes. She shows how one sequence in Monte Carlo accelerates its techniques to culminate in a patter song, creating a curve of rhythmic interest that sculpts the scene’s overall shape. Significantly, as in the famous choo-choo “Beyond the Blue Horizon” number, the song uses noises rather than music to launch its rhythmic arc. The case-study method leads Lea to some generalizations too, as in her survey of manners of dialogue underscoring. This section of the books seems to me especially rich, because it shows how tactics of underscoring associated with the 1930s “symphonic” scores were already available, at least sketchily, in the early years of sound. At the same time, she’s able to distinguish some creative options, such as the conversion of patter songs to a more conversational tempo, that seem very distinctive of these early sound films and not their successors. She and other scholars can now build upon her survey to track a variety of styles of dialogue underscoring. Okay, again, but these early musicals are still very pre-structured, you might say. What about movies that don’t rely on music so much and that give the actors more freedom during shooting? The book’s last in-depth analysis is devoted to probably the trickiest aspect of the whole problem: rhythm in speech, performance, and narrative. Lea points out that sound film acting required quite exact timing of pauses, glances, gestures, movement around the set, and deployment of hand props–probably tighter timing than in the silent era, with its shorter takes and greater scene dissection. (Consider how often a silent film gives us a close-up of a hand picking up something; in talkies, picking up something seldom gets that emphasis, so that the actor has to integrate the action into the flow of the full shot.) In sound filming, the shooting of the scene and the actor’s performance choices limited what an editor could do to slow it down or speed it up. Hawks is a notoriously difficult director to analyze because he doesn’t have an obvious signature style at the visual level. His conception of cinematic art relied upon his players. He famously developed his scenes slowly, letting actors improvise, asking screenwriters to recast the scene, and working out the blocking gradually. In this actor-centered cinema, we’re often told, a lot of the Hawksian tang comes from overlapping dialogue. Lea points out, though, that overlapping dialogue was already in wide use on the theatre stage and Hawks was comparatively late in importing it to film. His earliest 1930s experiments don’t owe much to it, largely because early sound technology couldn’t discriminate voices very well. Lea breaks new ground in showing other ways in which speech patterns, regulated through rhythm as well as pitch and timbre, not only contribute to characterization but supply that zesty bounce we associate with the Hawksian world. His tactics include shifting actors around the set, letting background and foreground sound alternate in clarity, and shortening scenes. Lea goes on to show how these and other options led Hawks to create the “tough talk delivered in a tough way” that became one of his hallmarks. By measuring the length of actors’ lines in seconds and fractions of a second, she’s able to track a subtle orchestration of voices–long speeches delivered fast (or slow), short speeches delivered slow (or fast), and many varieties in between, all interwoven. Overlapping comes in occasionally, as icing on the cake. When it does, especially in Twentieth Century, Lea is ready to specify it, showing how syllables and phonemes are stepped on or cut off. Film Rhythm after Sound is a breakthrough in showing how narrative cinema masters time in its finest grain. We’re used to talking about scenes, shots, and lines of dialogue. Lea has taken us into the nano-worlds of a film: frames and parts of frames, fractions of seconds, phonemes. As Richard Feynman once said of atomic particles, “There’s plenty of room at the bottom.” Of course Lea doesn’t overlook characterization, plot dynamics, themes, and other familiar furniture of criticism. But she shows how our moment-by-moment experience depends on the sensuous particulars that escape our notice as the movie whisks past us. We can’t detect these micro-stylistics on the fly. Yet they are there, working on us, powerfully engaging our senses. Film criticism, informed by historical research, seldom attains this book’s level of delicacy. Analyzing a movie’s soundtrack will not be the same again. Again, to investigate the clips supporting the book’s argument, start at the University of California Press page devoted to the book. These take their place as part of the larger trend toward visual essays examining film aesthetics. Other examples are the work of Kevin Lee, Tony Zhou, and Matt Zoller Seitz. Now that we can quote a film, Lea shows us that we can do a kind of philology of it. This entry was posted on Sunday | February 1, 2015 at 10:59 am	and is filed under Animation, Directors: Disney, Directors: Eisenstein, Directors: Hawks, Directors: Lubitsch. Responses are currently closed, but you can trackback from your own site.